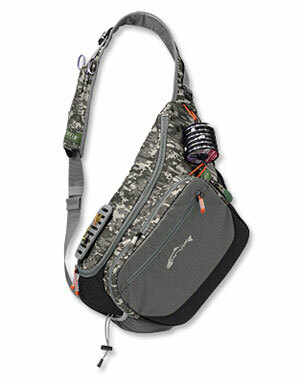 Enter Orvis’s Guide Sling Pack, a spacious but still streamlined solution to the ills of finitude. This is a remarkable system for either the wading guide or solo angler who wants to fish through the day without returning to base-camp or base-car for provisions. This thing has room—plenty of room—and not in one big mess, either. It consists of three discreet primary compartments, the largest of which will hold a Bugger Beast Jr. swaddled in extra personal layering material, the smallest a large C&F swing-leaf box, naked. The middle compartment will hold several steelhead-size spare spools, or a few well-freighted ham sandwiches. Your call. Of course, these perks would be largely wasted if the pack were cumbersome to access; it’s not. Simply detach one convenient buckle near your right armpit and the pack comes easily about face, all compartments accessible for spool swapping, fly changing, or general oblations. Two intelligently placed straps means your tippet spools stay out of the way while remaining conveniently accessible, and the front strap (which crosses your torso) has plenty of hooks and hovels for whatever tools you need immediately handy. The cherry on top is an external fly patch for drying flies and/or keeping hot ones handy. I used this pack for several weeks of winter steelheading and was thrilled that I could carry all the requisite tools of the trade—extra gloves, extra layers, lunch, streamer box, shooting head wallet, nymph box, spare spool—with room to spare. Switch rod in hand, I was ready for any situation the Great Lakes tribs could throw at me. Sweetest of all, the beverage holder held my thermos without issue (a cinchable draw string saw to that), and was placed in such a way that didn’t need to unsling the pack access it. I did not stay thirsty, my friends. To make a too-long story short (told you I’m no minimalist) this is a great, great tool for the serious itinerant trout angler, and a must-have for anyone who does a lot of wading for steelhead or smallmouth.